This recycling cart contains at least two items not supposed to be in there, according to Republic Services. We’ve been doing the recycling routine all wrong. We’ve been dumping stuff in those carts that can’t be recycled or for which markets have disappeared. This is costing Republic Services, the trash disposal franchise holder in Albany and surroundings, all kinds of problems. The main one is that that the Clackamas company receiving our recycling stream for sorting and resale has begun charging Republic money instead of paying it. The problem is that we’ve been tossing all kinds of stuff into the recycling bins that never was or no longer is possible to recycle, that is, become the raw material for new products. This has contaminated the material to the point where China, which used to accept most of the world’s refuse, stopped taking it as of this year. So just what is recyclable now? Julie Jackson, the municipal manager for Republic in this area, emailed me the company’s latest instruction sheet for customers. 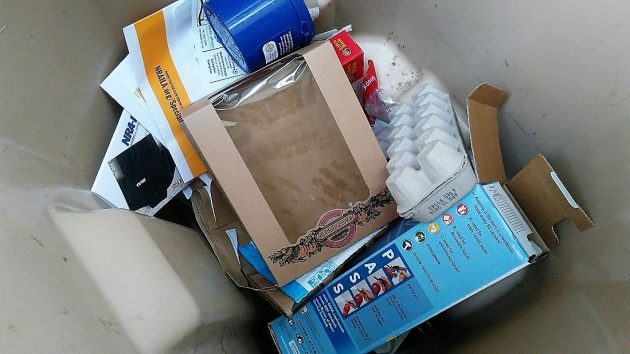 The prohibited list is longer: scrap metal, shredded paper, plastic cups, plastic jars, plastic tubs of the kind that hold margarine and so forth, aerosol cans, aluminum foil, “clamshell” and take-out trays, and also — this surprised me — egg cartons. Further, the items allowed in the carts must be “empty, clean and dry.” Because of that, the ban on plastic jars solves the dilemma of what to do with peanut butter jars. Since you can’t thoroughly clean them without expending a whole lot of hot water and dish soap, and even then the residue clogs the plumbing as soon as it cools, the obvious answer is just to put the jars in the trash. I can live with these restrictions, but would really like to have 3 containers — one each for paper, tins, and plastic bottles and jugs. I am a bit surprised that glass was not mentioned at all. I guess the pickle and pasta jars must go in the trash then, along with the peanut butter, mayonnaise, catsup, mustard and other plastic containers. I guess they figure people know that glass bottles can be put out on the curb the same day as yard debris. Glass has never been allowed in the commingled carts. Glass can be recycled, just put it in the blue bin instead of the recycle cart. Instead of the status quo and charging more, I think they need to scout for more local recycling companies that take more of the things they are banning. Did they even consider looking for other resources to take and use our trash or how we could reuse it ourselves? Apparently, Iceland is buying garbage, I hear. Not certain if I read this correctly (HH -the punctuation and parenthesis may be misplaced?) No newspapers! Gosh, at times I do admit I think the current D-H (pre-HH) is so much trash but never thought that newsprint manufacturer’s could not recycle into new newsprint! And I admit to being guilty of looking for the recycle triangle on any plastic container and, if it had it, putting it in recycling. same with Paper bags (great to recycle to Kraft paper), etc. Phone books make great pulp, after deinking etc. I figure industry calculates raw materiel cost to a thousands of a cent and it it is more expensive, out the door, regardless of environmental cost. This is pure insanity in my humble opinion. You read that wrong. Newspapers are included in paper that can be recycled. I also almost mis-read that and briefly gasped at the thought of no more magazines, newspapers, or phone books, but the absurdity (relative to junk mail) straightened me out quickly. Am I right in assuming that hardcover books are OK if the covers and spine are completely removed to the point where you have a paperback for all practical purposes? Speaking of misunderstanding: looking up the definition of “book spine,” I didn’t understand clearly until I saw a diagram of book parts. As recycling evolves, wouldn’t Republic benefit from publishing and distributing an adhesive backed, water resistant sticker with the APPROVED AND PROHIBITED ITEMS to be placed on the lid of the recycle carts? Who the heck can remember all the “ new normal” rules? And take it a step further and tell customers where they can recycle around town e.g. egg cartons and scrap metal at Habitat Restore, styrofoam at St. Vinnies, etc? When we moved to town, Republic had a detailed list of who could take things that they couldn’t. Good idea. Maybe they should put the stickers on the lids themselves. Make it bold and attention-getting and make it scream “Stop, everybody! We now have a problem!” Just re-wording the same old milquetoasty newsletters won’t help much. They could even run an experiment by starting the stickers on some pickup days and comparing the results of post-sticker vs pre-sticker days. They show the same old stuff being OK, including egg cartons, peanut butter jars, aluminum foil, shredded paper, plastic tubs, and even pots and pans (but no glitter on greeting cards;). One of the filenames includes a date of 2013, the other is unknown (I’ve seen it for several years). Obviously obsolete. What’s going on here? That’s all. The other no-nos are just blithely listed among the OK items. Glass and yard debris and are picked up on alternating weeks. To clarify your challenge to identify the “unrecyclables” in the picture. My guess is the clam shell take out box, Styrofoam egg carton and probably the cardboard container with clear plastic. How about egg cartons made of compressed paper? It’s not that hard to wash plastic jars out, I do it all the time. BUT…if they are no longer going to be recycling plastic, then we need to go back to using glass. 10 points for ironic humor. Good job. A word about plastics. Not all plastics are the same. Some are fairly valuable and some are not. The little recycling symbol on the bottom, with it’s number, tells you which is which. Some have no symbol and are then worthless due to lack of labeling. Their utility varies, which is why a mixed recycling program makes it harder because no one can take the time to sort them individually when they hit a bulk recycling operation. The reality is that Republic’s business model was never sustainable. Force co-mingling and then require someone else separate. After I rec’d the blue Republic flier I went to their office in Albany to investigate. I was told that clear plastic PET clamshells with the recycle logo was not recyclable here in Oregon because PET is a low quality plastic (lousy, inaccurate answer). PET is recyclable but the method of “grinding” clamshell material creates a fine powder; not a “flake”. My conclusion?? Republic has not exercised due diligence—not done their homework. Republic just wants more money without doing the work needed. I encourage all Republic customers to attend the 4/9 Council meeting to stop the spiral.